Last week, Twitter engineer Raffi Krikorian presented a number of new stats about the microblogging service as part of a recruiting talk at UC Berkeley. One interesting stat involves the number of API calls that the site is seeing: Krikorian says that Twitter is seeing 6 billion API calls per day, or 70,000 per second. That’s more than double the amount (3 billion API calls) that Twitter was seeing in April, according to the Programmable Web. Some of the stats, including the fact that Twitter is seeing 90 million Tweets per day, we also heard at Twitter’s news event this past week. Krikorian delved into the amount of data storage each Tweet includes in terms of text (200 bytes for 140 characters). Twitter is seeing 800 Tweets per second, or 12GBs of Twitter text. And Twitter generates 8 terabytes of data per day (or 80 MB per second), whereas the New York Stock Exchange creates 1 terabyte of data per day. In his slides, Krikorian says Twitter’s 150 million users generate 1000 Tweets per second, and that Twitter eventually wants to be able to support half the world’s population and all of their devices (5 billion people and 6 billion devices, according to Krikorian). Challenges for the network, says Krikorian, include indexing, search, analytics, storage, scalability and efficiency. Twitter had a considerable amount of downtime over the summer due to record usage because of the World Cup, and was forced to cut API limits on Tweet read requests. 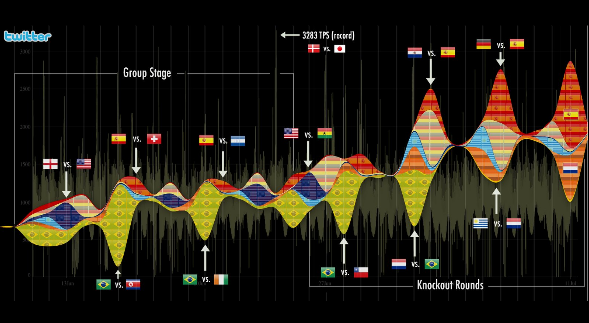 Krikorian presented a nifty slide in his presentation that shows the usage of Twitter by World Cup games (embedded below). As we wrote earlier this week, while the number of API calls from clients are increasing, traffic to Twitter is increasing as well. Co-founder Ev Williams told press that traffic to Twitter.com has grown about 100% this year; and with a shiny new interface, I’d expect traffic to continue to surge. The stats regarding the growth in API calls are somewhat ironic considering Twitter’s recent upgrades to its platform and what this could mean for developers. Unfortunately, as more and more users flock to a newer, more feature-filled (i.e. inline photos and videos; mobile apps) Twitter for interactions, developers that provide these features (and whose clients are contributing to these massive number of API calls per day) are probably going to lose traffic.